It’s terribly exciting. Leave the family behind (there’s a Thanksgiving buffet on Thursday or you can eat leftovers when you get back). 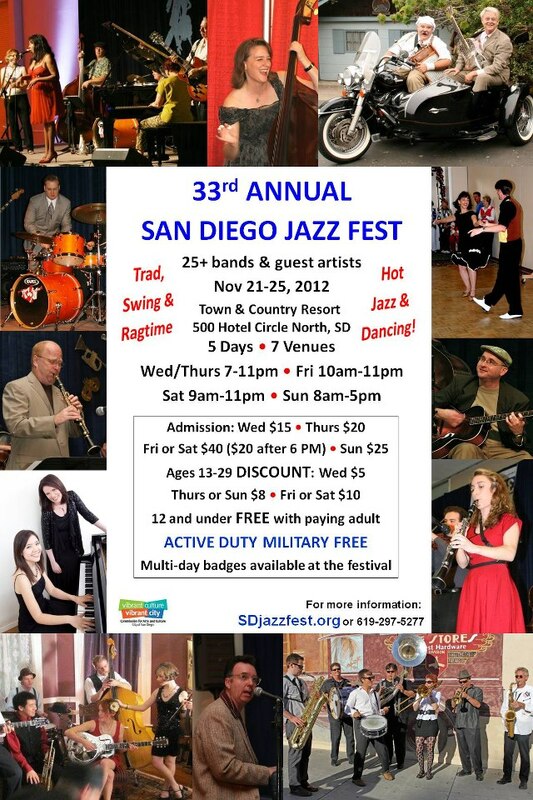 Spend the Jazz Thanksgiving of your life in San Diego. The festival schedule is still somewhat tentative, but the version I saw just made my head spin. Paul Daspit, who runs things, believes in Too Much Of A Good Thing (to quote from Mae West and Coleman Hawkins). On Friday, for instance, I counted sixty-nine or seventy separate sets — featuring Grand Dominion, the Reynolds Brothers, Yerba Buena Stompers, Sue Palmer, Cornet Chop Suey, Tim Laughlin / Connie Jones, Uptown Lowdown, Dave Bennett, Carl Sonny Leyland, Chris Dawson, Dave Bennett, Ray Templin, Stephanie Trick / Lorraine Feather, Heliotrope Ragtime Orchestra, Titanic Jazz Band, Red Skunk, a brass band, a banjo band, a parasol parade . . . I know that this year I will have to bring energy bars and water just to survive, because even for someone like me, who needs regular meals, eating will have to wait. I just wish Sir Isaac Newton had discovered some way for me to be in three places at the same time, although that would have meant three tripods, three cameras, and a separate suitcase for batteries and chargers! If you live near San Diego or can get there, you can also barter your time and energy for jazz, which is never a bad bargain. Volunteers for the San Diego Thanksgiving Dixieland Jazz Festival work four-hour shifts as door monitors or in a variety of desk jobs, receiving a one-day badge for each day worked and may volunteer for one up to all five days. Badges are good for the entire day on the day worked, so come early, stay late, and enjoy the music. Assignments are made on a first-come, first-served basis; however, preference is given to AFCDJS members. All venues are on the grounds of the Town & Country Resort & Convention Center. Click here (and don’t wait!) for more information. Posted in "Thanks A Million", Bliss!, Generosities, Hotter Than That, Ideal Places, Irreplaceable, Jazz Titans, Jazz Worth Reading, Pay Attention!, Swing You Cats!, The Heroes Among Us, The Real Thing, The Things We Love, Wow!